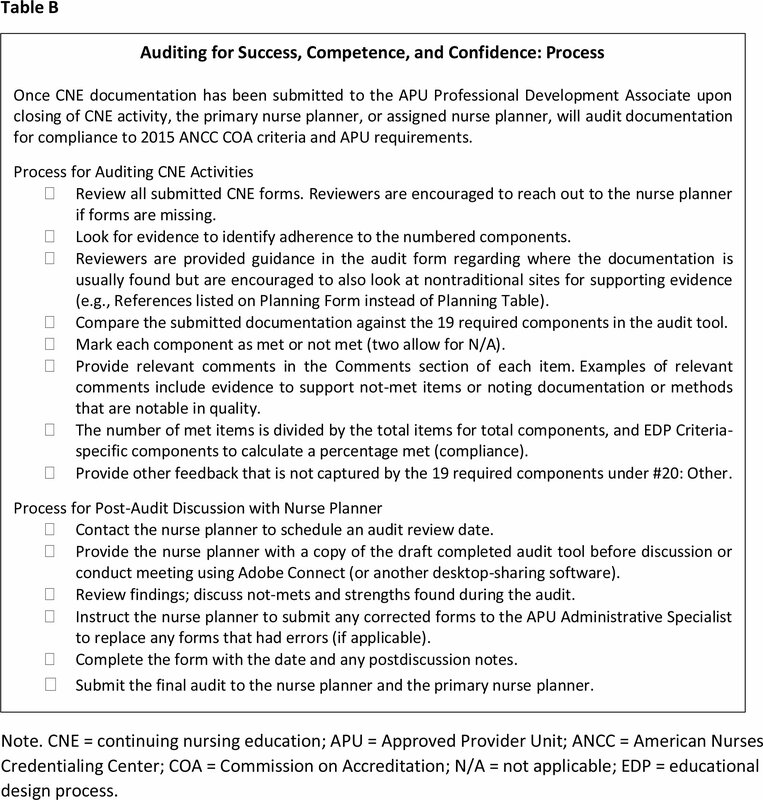 To capitalize on the adoption of the revised American Nurses Credentialing Center's Commission on Accreditation (ANCC COA) 2015 Criteria, the primary nurse planner of the North Carolina Division of Public Health's approved provider unit (APU) sought to improve structural capacity and quality outcomes by using a capacity-building continuing nursing education (CNE) documentation peer audit process. A new audit tool was built using the Plan-Do-Study-Act (PDSA) model (Agency for Healthcare Research & Quality, 2013; Hughes, 2008) by comparing existing documentation practices while adopting the revised ANCC COA criteria. During succeeding PDSA cycles, the audit tool was revised based on feedback from the APU nurse planners and documentation peer audits using the 2015 criteria. Knowledge gained from the audits informed the development of the APU's processes and procedures. The North Carolina Division of Public Health's APU plans, implements, and evaluates approximately 60 new CNE activities each year for public health nurses working in North Carolina's local and state public health agencies. The APU is managed by the primary nurse planner who plans CNE activities and provides oversight for all unit functions. Nurse planners coordinate CNE activities in addition to their responsibilities as public health nurse specialists in administration, school nursing, women and children's health, communicable diseases, and public health nursing practice consultation (Little, Dickerson, Randolph, Rocco, & Short, 2017). All unit nurse planners also serve as CNE documentation peer auditors. In 2016, all CNE provider units were tasked with adopting the revised ANCC COA 2015 criteria. Initially, the APU nurse planners believed the adoption would be challenging because they had to manage the process of planning, implementing, and evaluating CNE activities while simultaneously learning the revised ANCC COA criteria. However, the primary nurse planner was committed to maintaining a competent and confident nurse planner team. The primary nurse planner would reach this goal by ensuring the nurse planners had the knowledge and tools needed to make the successful transition by building a CNE documentation peer audit process that would capture adherence to the 2015 ANCC COA criteria and local provider unit requirements, and would be viewed as a capacity building, nonpunitive process by the nurse planners. A work team was created to look at the current process of planning, implementing, and evaluating CNE activities. An audit tool was built to capture adherence to the 2015 ANCC COA educational design process (EDP) criteria and local APU requirements. Prior to the adoption of the revised 2015 EDP criteria, the audit tool was tested on CNE activity documentation that used the 2013 EDP criteria (ANCC, 2013a, 2013b). Although the audit tool did not fully align with documentation that adhered to the old criteria, testing the audit tool on familiar documentation allowed the primary nurse planner to focus on the components of the audit tool without the distraction of new and unfamiliar approver unit required forms. After the first CNE activity was planned following the revised criteria, the audit tool was tested and evaluated on the new documentation and criteria. Completing three PDSA cycles with the audit tool helped ensure that the audit tool captured the required components and that the peer audit process would be viewed as capacity-building. Evaluating educational activities is critical to ensuring learner outcomes have been met and knowledge gaps have been filled (Dickerson, 2016). Of equal importance, the provider unit must evaluate CNE activities for adherence to compliance standards associated with the EDP criteria (ANCC, 2015). Performing regular audits is an evaluative process because it follows a systematic approach to measure performance and compliance by collecting information and data that can be used to improve processes (Gillam & Siriwardena, 2013). The information learned from regular audits is useful for planning for process improvement. The use of improvement methodologies is a vital step in assessing and improving processes. By using process improvement models, information gained can be used to make necessary adjustments to the process steps to gain efficiencies. 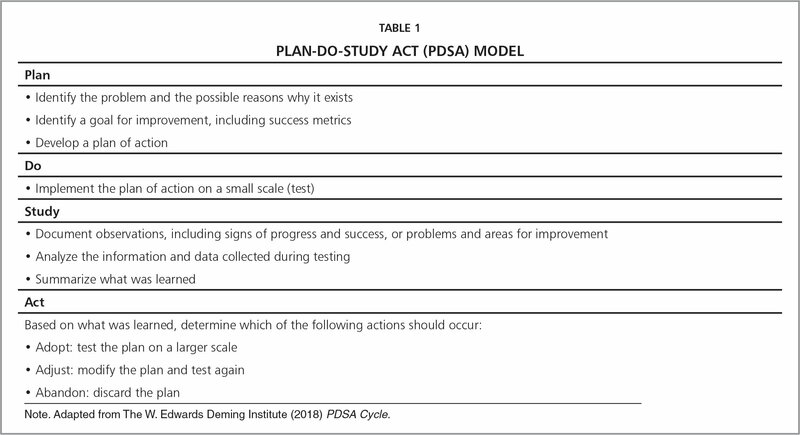 The PDSA model is a continuous process improvement model championed by W. Edwards Deming (The W. Edwards Deming Institute, 2018). The four-stage model evaluates process changes to determine whether they add value. The PDSA model can be used at multiple stages as processes evolve to determine the efficiency and effectiveness of the changes (Institute for Healthcare Improvement, 2018; Hughes, 2008). Table 1 shows the steps that traditionally occur in the PDSA model. A team was brought together for a 3-day work session to help transition from the 2013 ANCC COA criteria to the revised 2015 ANCC COA criteria. The team consisted of five nurse planners representing multiple public health nurse specialties, the APU professional development associate, the Division of Public Health Chief Nurse, the primary nurse planner, and a performance improvement consultant. An initial accomplishment of the work team was the creation of a process map of the steps the nurse planners followed to plan CNE when using the 2013 EDP criteria. The team then mapped out the necessary steps the process would need when following the 2015 EDP criteria (Little et al., 2017). The two process maps were compared, and areas in the new process map that diverged from the old process map were identified. The work team then created a draft peer audit tool incorporating the 2015 EDP criteria and local APU requirements such as new forms. A draft audit process was created to support consistent implementation and to ensure that all new identified processes, such as newly implemented due dates and documentation deadlines, were captured. The work team named the new peer audit tool and process “Auditing for Success, Competence, and Confidence” to reflect the process as capacity building instead of punitive. The new tool and process were ready to be tested. Plan. Documentation based on the 2013 EDP criteria would be used for the first test. Process steps of CNE activity planning, implementing, and evaluation also would be evaluated. Do. The primary nurse planner tested the first draft of the audit tool on one CNE activity that was documented based on the 2013 EDP criteria. Inconsistencies were noted when a component of the 2015 EDP criteria was missing in the CNE activity documentation. The map of the current CNE planning process also was reviewed to look for and note opportunities to improve when implementing the revised criteria. Study. The testing of the new draft audit tool, including looking at the overall process of planning and documenting CNE activities, revealed inefficiencies in the process steps and gaps in documentation. The activity planning process included a step where all documentation had to be reviewed by the APU primary nurse planner before any CNE activity was provided. This requirement caused a potential barrier to providing timely CNE activities. Emphasis was put on the completeness of documentation as opposed to the quality of the activity's EDP. Knowledge gaps and educational needs were inconsistently verified and documented. Act. Based on the results and information learned about the current process, the primary nurse planner decided to adopt the draft audit tool and test it again on documentation resulting from the first CNE activity planned after adopting the 2015 EDP criteria. Plan. 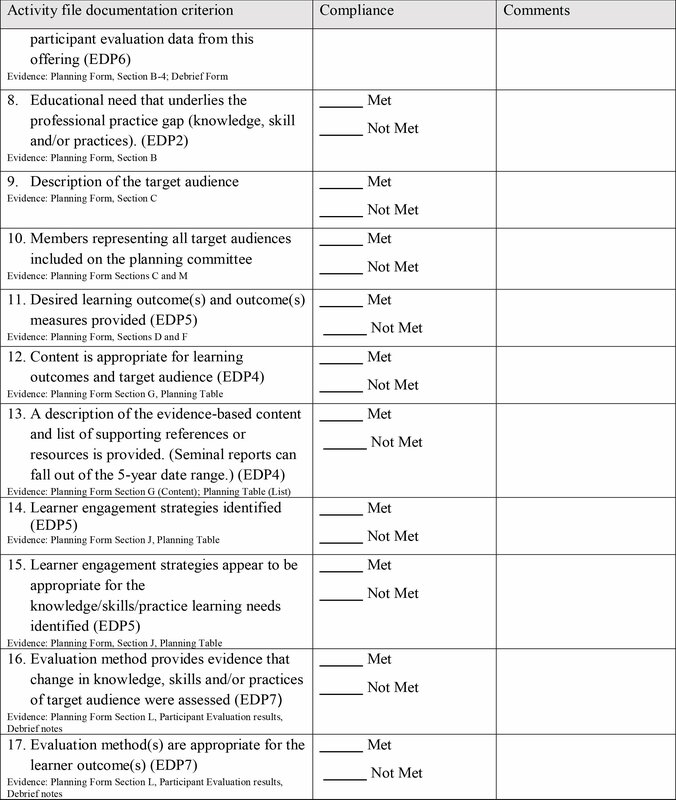 The primary nurse planner would test the draft audit tool to evaluate the documentation of the first CNE activity using the 2015 EDP criteria. Do. 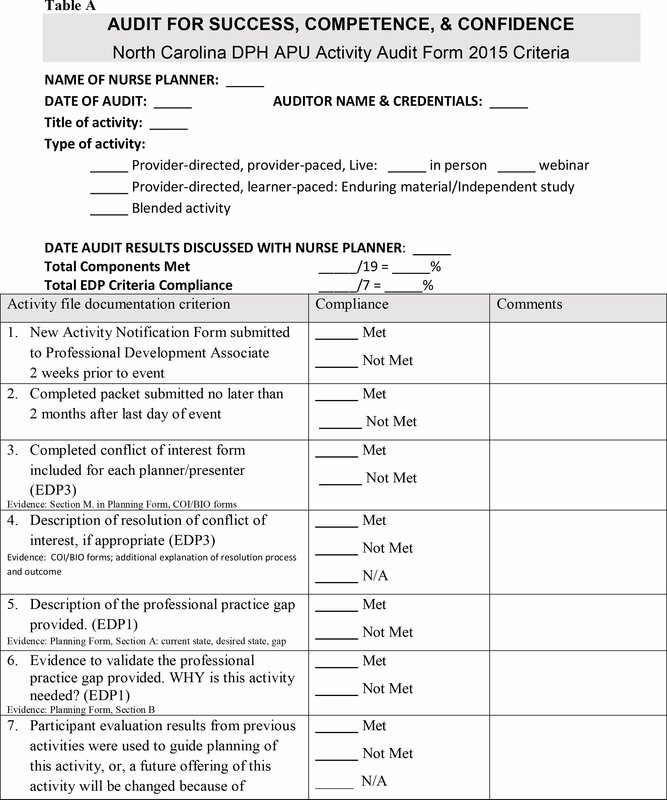 The primary nurse planner tested the draft audit tool on one CNE activity that used the 2015 EDP criteria and noted when documentation of a component of the 2015 EDP criteria or local APU requirements was missing or incorrect. Study. The audit revealed the nurse planner had incorporated the revised 2015 EDP criteria and local APU requirements in the CNE documentation. Thus, the audit process effectively captured that the documentation had met all EDP and APU audit components. Act. With the audit components of the tool testing as effective, the primary nurse planner determined that a process change was needed to use nurse planners as CNE activity peer auditors. A further revision of the audit tool would be needed to add elements that would support the capacity of the peer auditors. Measurement elements also would be added to capture data for the APU's quality outcomes. Plan. The primary nurse planner brainstormed how the audit tool and process could be improved by incorporating references to the location where evidence for each component is typically found in the documentation and how data from the tool could be used to support the APU's quality outcomes. The audit tool would be modified to incorporate the improvements. Location references describing where to find evidence of each component in the required documentation. A section capturing the overall compliance score and the 2015 EDP criteria compliance score. A new component to indicate that the audit results were reviewed with the nurse planner. The primary nurse planner and two peer auditors tested the revised audit tool on three CNE activities that used the 2015 EDP criteria. Study. The audits revealed that all documentation met all 2015 EDP criteria and APU audit components. In addition, the peer auditors provided feedback indicating that adding the location references assisted them as they were learning the revised criteria and audit process. The peer auditors also shared they felt the revised audit tool would help them sustain compliance with the 2015 EDP criteria. Finally, the scoring section provided an accurate measurement of compliance that also could be tracked over time for performance improvement. Act. The primary nurse planner revised the audit process. The audit tool and process were adopted into the overall standard operating procedures of the APU in October 2017 (Table B; available in the online version of this article). Feedback received from the nurse planners who served as peer auditors indicated that the Auditing for Success, Competence, and Confidence process was not only enjoyable but also helped increase their knowledge of the 2015 ANCC COA criteria. In addition, the nurse planners believed the peer audit process increased their competence as nurse planners and their ability to accurately document the CNE activities using the required forms. The peer audit process and tool have been integrated into unit operations, and the nurse planners are expected to use the findings from the CNE documentation audits to improve their nursing practice as CNE nurse planners. Data and information gleaned from the audit process will support the APU's structural capacity and be used to enhance and improve quality outcomes. Using the PDSA model, an evidence-based approach to process improvement, to create the Auditing for Success, Competence, and Confidence peer audit tool and process helped the nurse planners and APU to successfully transition after the adoption of the 2015 ANCC COA criteria. The PDSA model provided valuable insight into the changes that were needed when implementing the 2015 ANCC COA criteria. As CNE-related criteria and requirements are updated in the future, using the PDSA model will be an effective method of assuring that the peer audit tool and process remain current and pertinent. American Nurses Credentialing Center. (2013a). Educational design process 2013 mini manual. Silver Spring, MD: Author. American Nurses Credentialing Center. (2013b). 2013 ANCC primary accreditation application manual for providers and approvers. Silver Spring, MD: Author. American Nurses Credentialing Center. (2015). 2015 ANCC primary accreditation provider application manual. Silver Spring, MD: Author. Gillam, S. & Siriwardena, A. (2013). Frameworks for improvement: Clinical audit, the plan-do-study-act cycle and significant event audit. Quality in Primary Care, 21, 123–130. Review all submitted CNE forms. Reviewers are encouraged to reach out to the nurse planner if forms are missing. Look for evidence to identify adherence to the numbered components. Reviewers are provided guidance in the audit form regarding where the documentation is usually found but are encouraged to also look at nontraditional sites for supporting evidence (e.g., References listed on Planning Form instead of Planning Table). Compare the submitted documentation against the 19 required components in the audit tool. Mark each component as met or not met (two allow for N/A). Provide relevant comments in the Comments section of each item. Examples of relevant comments include evidence to support not-met items or noting documentation or methods that are notable in quality. The number of met items is divided by the total items for total components, and EDP Criteria-specific components to calculate a percentage met (compliance). Provide other feedback that is not captured by the 19 required components under #20: Other. Contact the nurse planner to schedule an audit review date. Provide the nurse planner with a copy of the draft completed audit tool before discussion or conduct meeting using Adobe Connect (or another desktop-sharing software). Review findings; discuss not-mets and strengths found during the audit. Instruct the nurse planner to submit any corrected forms to the APU Administrative Specialist to replace any forms that had errors (if applicable). Complete the form with the date and any postdiscussion notes. Submit the final audit to the nurse planner and the primary nurse planner. Dr. Little is Manager, Public Health Nursing and Professional Development Unit, North Carolina Division of Public Health, and Ms. Busick is Chief, Strategy and Planning, and Interim Chief, Health Care Personnel and Credentialing, North Carolina Department of Health and Human Services, Raleigh, North Carolina. Address correspondence to Susan Haynes Little, DNP, RN, PHNA-BC, CPHQ, CPM, 11 Deer Lake Trail, Wendell, NC 27591; e-mail: DrSusanLittle@alumni.duke.edu.